Easy ensaymada recipe that’s simple to follow so you can make soft, sweet, cheesy ensaymada at home. Enjoy with your morning coffee, your afternoon tea or with that steaming cup of hot chocolate you deserve tonight! Happy new year everyone! Did you have a nice holiday break? Ready to take on the new year? Have you decided on a resolution yet? I did, I am, I haven’t. I have been trying to get better at working with dough since the latter part of last year though. Does that count? Conquer dough? Well, there’s no New Year’s Resolution Police so I guess that’ll be ok.
It’s been a challenging – albeit delicious – process but I’ve already perfected a few recipes (yay). This ensaymada recipe is one of them (and this delicious pandesal recipe is another). It’s a cherished Filipino snack so it’s extra special; I’m excited to share the recipe with you! Think of ensaymada bread as a cinnamon bun – soft and tender – but without the cinnamon and the frosting. Instead, the lovely brioche is generously brushed with butter, dunked in sugar and again generously sprinkled with cheddar cheese. That’s what Filipino ensaymada is (pronounced n-sigh-ma-duh…don’t you just love how I spell these things out lol!). 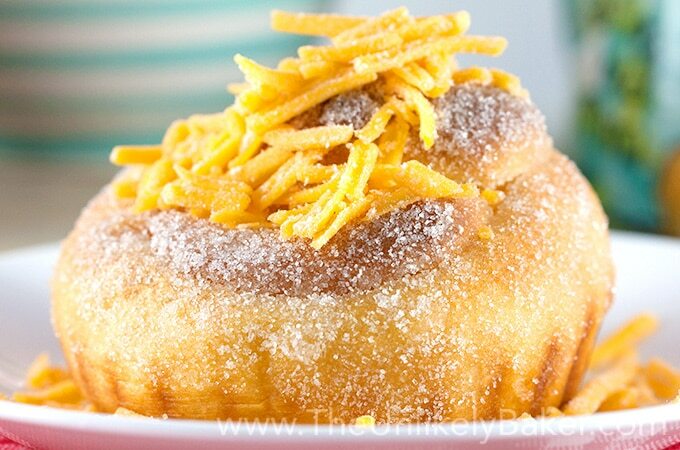 Some people call it Filipino sweet buns, soft sweet bread or cheesy bread. They’re all true, though ensaymada is most likely the word you’re looking for! If you google what ensaymada means, you’ll find that its roots can be traced back to a pastry from the Spanish island of Majorca. The Philippines was under Spanish rule for almost 400 years after all so a lot of our food, culture and even language have strong Spanish influence (like these churros!). Bottom line: ensaymada is delicious. 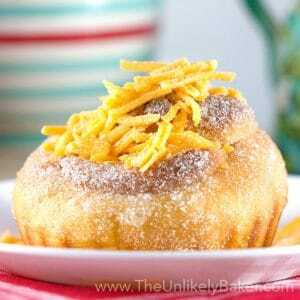 How to make ensaymada – the easy way! Full disclosure: making ensaymada is a lengthy process (as is typical of homemade breads). So I decided to make it simpler – if you take a peek at the recipe below, each step is short and easy. I broke it down into pain-free, manageable parts (my brain is wired that way). There are 5 “phases” – from activating the yeast to sprinkling the cheese on the finished product. Follow each phase and you’ll do great! It’s not exactly the same as the ensaymada you’ll find at a local Filipino bakeshop but it’s a darn good one if I say so myself! One hundred percent easier to make too. and you can find them at your local baking supplies store and Amazon. , you’re good to go. For the fluffiest ensaymada, allow your dough to rise in a warm, dry place. I use my oven for this. I usually preheat it to about 100F then turn it off just when I’m about to knead my dough. This way, the temperature would have gone down to 90F when I put my dough in. to make sure the dough is evenly divided. Then you’re all set! 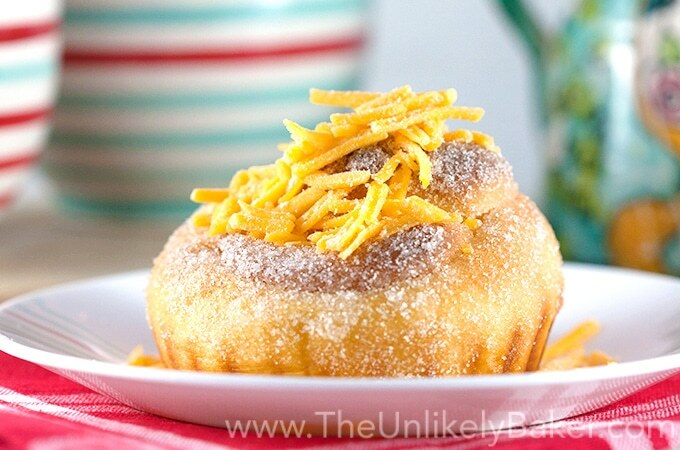 Eat ensaymada for breakfast or, like most Filipinos, as merienda or afternoon snack. Dunk it in tsokolate or hot chocolate while you’re at it! Enjoy! 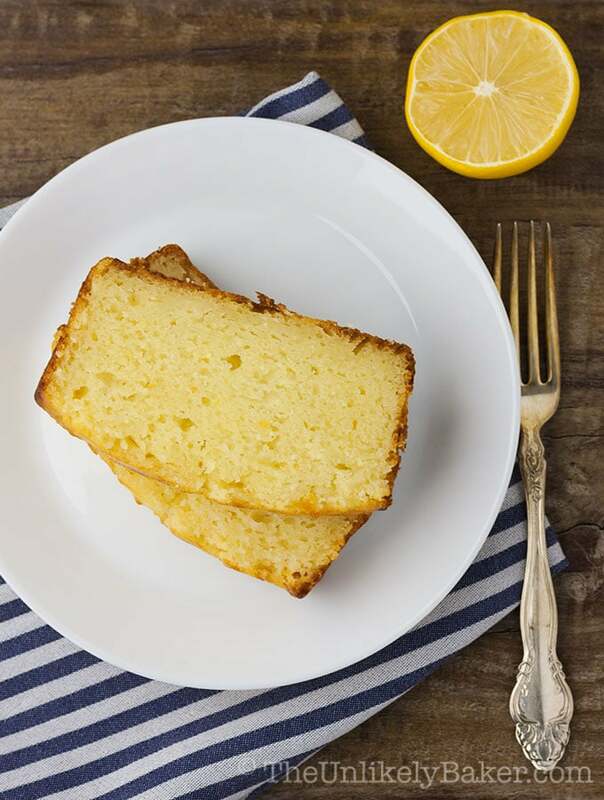 Meyer lemon ricotta pound cake is sweet, lemony, you can’t stop at just one slice! 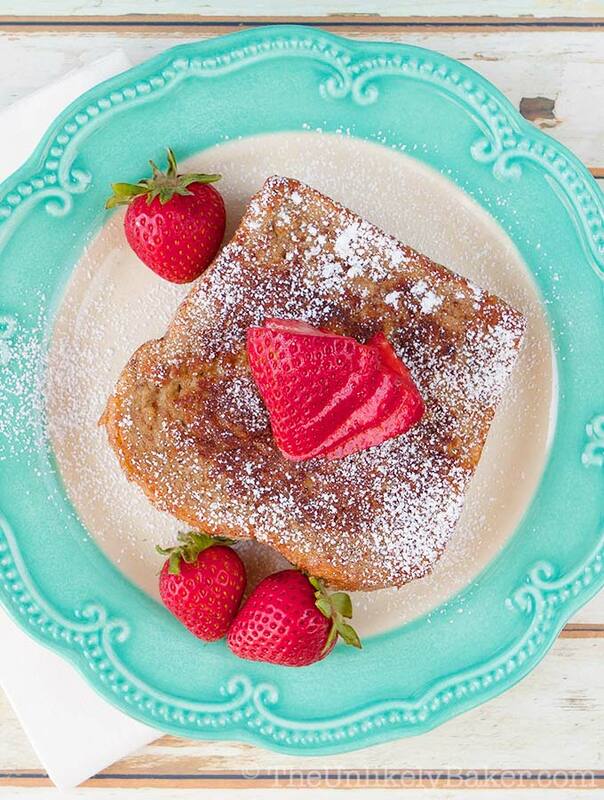 For an extra special breakfast, try making a batch of strawberry cream cheese stuffed french toast. 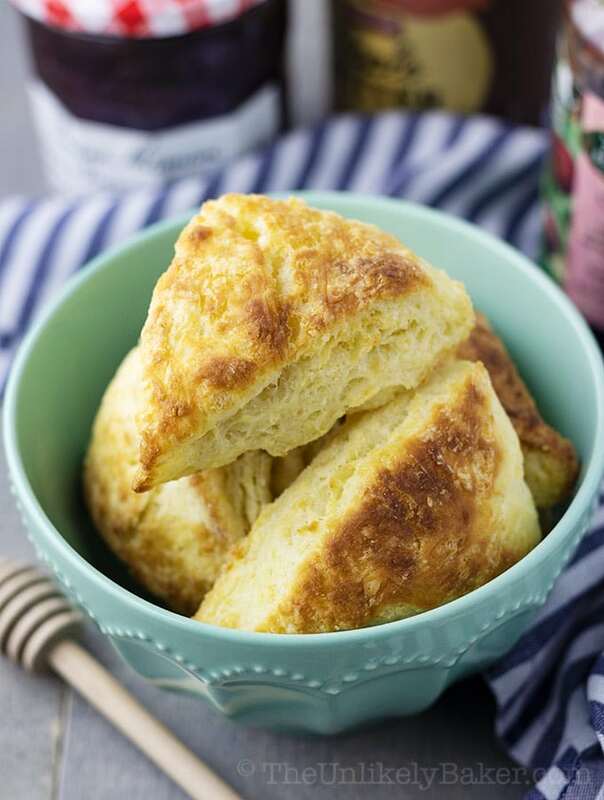 And if you’re looking for something quick and easy but still delicious, these buttermilk scones are for you. Easy ensaymada recipe that’s simple to follow so you can make soft, sweet, cheesy ensaymada at home. In a medium saucepan on medium heat, warm 1/2 cup milk until you see bubbles forming at the edges. Remove from heat and stir 1/4 cup sugar, 1 teaspoon salt, and 1/4 cup butter until the butter has melted. Once the dough starts pulling and sticking together in a ball, transfer it into a lightly floured surface and knead until smooth and elastic (8-10 minutes). When in doubt, knead some more. Oil a large bowl with 1 tablespoon canola oil. Place your dough in the bowl and turn to ensure the whole dough is coated. Cover with a damp cloth and allow to rise in a dry warm place (about 90F - see notes) until it doubles in size (about 1 hour). When your dough is ready, transfer it into a lightly floured surface and roll out slightly. Evenly divide the dough into 12 pieces (see notes) and flatten each one into a 4x6 inch rectangle. Brush each piece with melted butter and sprinkle with cheddar cheese. Roll the dough tightly up and pinch the edges to seal. Then roll each one into itself (like a spiral) and place onto your ensaymada moulds (see notes). Brush the tops of each ensaymada with butter, cover with damp cloth and let rise for another 30 minutes. Preheat your oven to 375F and bake for 20 minutes or until golden brown. Do not over bake. Let cool in the mould and when it's cool enough to handle, put your toppings. Brush the still warm ensaymada with melted butter then dip in a bowl filled with granulated sugar. Sprinkle with cheddar cheese. Serve warm. I keep my dough in my oven to rise. I usually preheat it to about 100F then turn it off just when I'm about to knead my dough. This way, the temperature would have gone down to 90F when I put my dough in. I use a kitchen scale to make sure my dough is evenly divided. If you don't have ensaymada moulds, you can use a muffin pan instead. Did you try this easy ensaymada recipe? I’d love to hear from you in the comments section below. I love your steps, makes it so easy to stay on track! Organizing is key so you don’t miss any steps/ingredients. just genius! I’m so glad you and your family liked them Zsaleh! Hope you’re having a wonderful holiday season. Oh yum, this looks so good! I’ve never even heard of this before, but now I have to try it. These look totally sinful and rather irresistible! Wow, I’m in love with this bread and I haven’t even tried it yet, but I will! Awesome! Hope you like it Eileen! I need to try this! it looks so good! thanks for sharing with us! gosh knows how much I love cheese! It’s so frustrating isn’t it?? But when I get it right, well it’s hard to beat the smell of freshly baked bread 🙂 Thanks Bobbi! Hope you like this! I love learning about these new recipes from your blog! 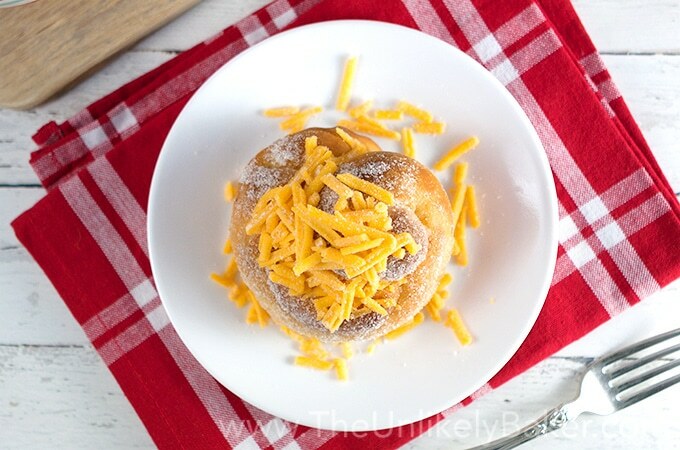 Sweet rolls and cheese are two of my favorite things, so I’m positive they’re even better together. The hot chocolate sounds perfect with it as well! Hi Liz! I’m glad 🙂 Sugar and cheese, hard to say no to! And hot chocolate of course. Hope you’re having a great week! Yum! This bread looks heavenly! It reminds me of mallorca sweet bread from Puerto Rico, except it doesn’t have cheese. I think I’d love the addition of the cheese. I mean, cheese + carbs?! How could you go wrong with that?! And if you can make this, you can definitely make any other yeasty treat! Aw thanks Sharon! Coming from you that means a lot 🙂 I really want to get better this year. Yes!! Ensaymada! Ahh I haven’t had one in forever and have never thought about making them at home but now I will. So simple, and so delicious! It’s a childhood favourite! 🙂 Perfect with tsokolate! This looks and sounds amazing! I want one in my mouth right now! I had never heard of these before but I want one NOW!!! The photos look so yummy. I can’t wait to try them out. Thanks for sharing and Happy New Year! Thanks Jennifer! Happy new year to you too! I’ve never heard of ensaymada, but it looks wonderful. 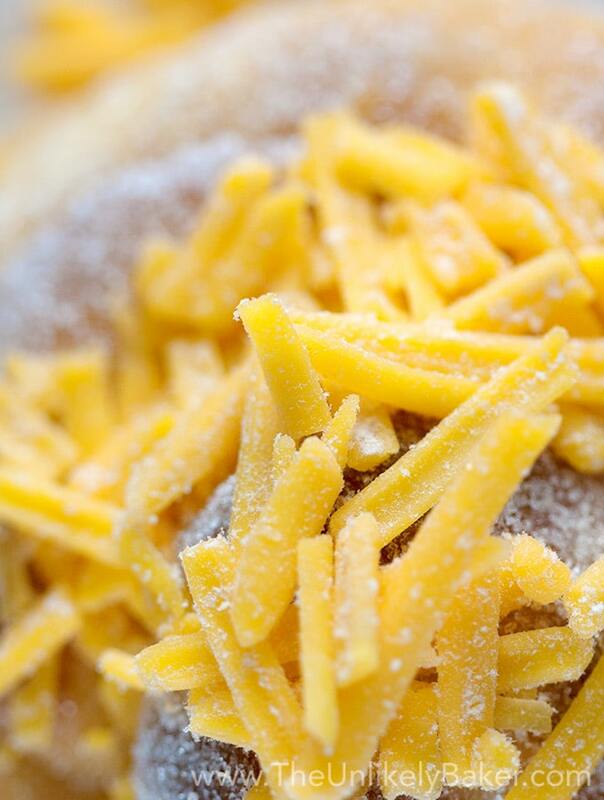 Who wouldn’t like buttery, sweet, bread topped with cheese? Yum!! I must admit, buttery, sweet and cheesy is pretty hard to resist 🙂 Thanks Kimberly! Wow this sounds amazing! I’ve never had anything like this before. Yum! I really want those scones! This dish looks really tasty! I’ve never tried Ensaymaya, thanks for sharing. I always learn something new every time I visit your site! These are delicious! my mouth is actually watering reading this recipe and looking at your pictures! This sounds incredible. I am game for anything that has cheese in it! Thanks for sharing, it was fun learning about a new food! Happy New Year! You’re too kind Kristen! 🙂 The cheese is everything isn’t it?? Happy new year to you too! I’ve never tried an ensaymada but I’m sold! This looks so incredible and tasty! Oh wow, this sounds so delicious! I’ve never heard of this bread but sounds like one I need to try! Never heard of ensaymada’s before but can’t wait to try this! Sign. Me. Up! Dough that is sweet and cheesy well I’m in for all its worth. Like how you gave us the history on this recipe. Right? Sugar and cheese in one bite – hard not to like 🙂 Thanks Candy! Love brioche!! It’s so tasty. What you’ve done here sounds and looks like it’s outta this world amazing! Hahaha this made me laugh Dawn! I might be the only person in the world welcoming the new year with carbs sugar and cheese LOL! Well I ate salad yesterday, that must count for something teeheee. Yes, cheese is pretty hard to resist 🙂 Have a wonderful new year yourself my friend! This looks and sounds absolutely delicious! Happy new Year! Thank you Lexi! Happy new year too! That looks amazing! I am a Filipino and I grew up in the Philippines. This is one of the things that I miss back home. These look so good! Ive never tried one but it looks delicious! Delicious! Speaking of cinnamon roll, in here (Romania) we are more into something similar but with nuts – that’s our guilty sweet pleasure. But, besides this, we are also crazy for salty pastry. But in the end, having something with sweet and salty combined, is something to die for! So yes, this brioche is absolutely perfect. 🙂 And as a fun fact, to get my weird taste: I love eating sweet crepes with salty white cheese. Haha! Hi Maria! That sounds so delicious! Is it cinnamon based? I’d have to look it up 🙂 And I agree, I love salty sweet combos, it satisfies both my cravings in one bite! I gotta try your sweet crepe + salty white cheese combo too. You’ve given me so many delicious ideas! I did, I guess and I won’t be 😉 This sounds utterly delicious, I love finding new things I have never heard of and this is completely new to me and is right up my street. I love these so much! My best friend’s Mom made these and I always loved it when she did. I never thought to try it out on my own. It looks soooo good! I’ve never heard of this before…sounds so interesting need to try! These look amazing – and oh my goodness those pictures!! Gorgeous! I love learning something new when I read blog posts. I’ve never heard of ensaymada before, but now I know what it is….and it sounds delicious! Hi Lisa! Me too 🙂 It’s so interesting learning about other cultures and traditions and just the way other people live. I am going to have to try this! I love how you broke the recipe out! This looks wonderful! I can definitely see enjoying this with coffee in the morning. What an interesting combination! I’ve never paired those things together, but to be honest, I’ll try anything that’s sprinkled with cheese! This looks great! LOL I’m the same. Who says no to cheese?? Haha. Thanks Divya! Haha that’s me usually 🙂 So if I can do this I’m sure you’d do great! Brioche is my favorite bread! Adding cheese just makes it AH-mazing!!! Mmmmm … I love Filipino food!! But I’ve never heard of this dish before. Will try to make it some time for sure. Happy to hear that you do! 🙂 Hope you like this one. I love the sweet savoury combinations of filipino foods…and I love bread lol! So I’m really into this! Nice! Hope you get to try the recipe one day soon! Oh I’m happy to hear that! I have never heard of ensaymadas before, but these sound fantastic! I love how you added some history to your piece and even included a bit of personal honesty – lol. Keep up the good work and thanks for sharing what sounds like some Filipino deliciousness! I have never heard of the ensaymada before reading this post, but the way you describe it, makes me want to make it and eat it! I love that it seems easy! OMG I wish I didn’t see it 😀 Cinnamon roll and cheese <3 yuuuuum! The recipe seems pretty easy I definitely have to try it ! I love trying new international snacks! I’ve never been a fan of mixing sweet and savoury but seeing as this has cheese on it, I think I could make an exception! I’ve never tried an Ensaymada, but I definitely need to change this! It looks incredible and so easy too! Happy New Year! I’m all in for(Ensaymada) Brioche dunked butter and sugar.